The Melbourne Storm is a rugby league club that participates in the National Rugby League (NRL) in Australia. As the first fully professional rugby league club based in the state of Victoria, the Storm entered the competition in its inaugural season in 1998. They spent little time making their mark, winning their maiden Premiership in just their second year. Of the 16 competing teams in the NRL, the Storm are the second most successful, with three Premierships, four runner-up places and four Minor Premierships. The old logo had been around since the club’s inception. It had all the elements of the archetypal sports team logo – the heavily-customised type, the eye-catching colour palette and, of course, the angry-looking mascot. Like it or not, it had bucketloads of personality. It’s clear that the designer took the “Storm” name and ran with it, depicting a storm cloud and expressing lightning through the jagged, pointy logotype. The best aspect was undoubtedly the bolt integrated into the “R”. The “Storm Man” rising above the cloud like a god looked powerful and menacing, poised to strike his enemies – certainly the kind of mascot you’d want to have to intimidate your opponents. In the rendering, though, I felt the highlights and shadows were all over the shop, as if different parts of his body were lit from different directions. And where was his ear? Some refinement here could have gone a long way. Finally, the faux-italic slant of “MELBOURNE” was excessive, even if it was to match that of “STORM”; it just looked a bit distorted. Overall, the old logo succeeded in capturing the competitive spirit of the team; however, after 20 years, the issues in its execution were making it look glaringly amateurish and so it was high time for a refresh. The purple trademark remains as an unwavering reminder of what the Storm army and their city are proud to stand behind. The only NRL team to wear the colour – purple has become a symbol of unity and passion for Storm fans and Melburnians over the last 20 years. 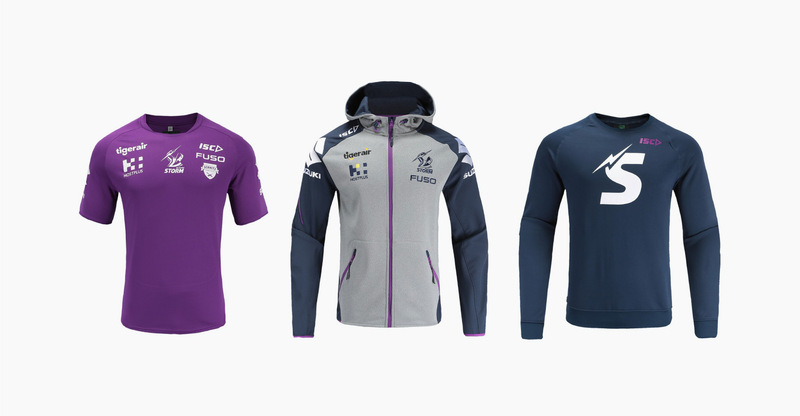 Purple will be accompanied by Navy and Grey – a respectful nod to the past whilst embracing a bold, fresh approach to the future. While the iconic Storm Man holding the lightning bolt remain critical elements to the identity of the Club. Our first glimpse of a new logo came with the reveal of a commemorative “20 Years” emblem in October 2017 (above left), which was used on the club’s 2018 apparel and membership packs. Now that the milestone has passed, we are left with the Storm Man on his lonesome, but some tweaks are apparent. I will review this latest version only. The first noticeable change is the absence of yellow/gold. The colour was originally introduced simply to make merchandise more attractive, and it hasn’t always featured on player uniforms (apart from on the logo). Navy blue and purple have endured as the main colours and are naturally carried through, along with the distinctive “V” design. The new Storm Man has been simplified but remains recognisable due to his pose and the similarity of his facial features. The lightning bolt in his hand is now more compact and better defined by the white colour and more exaggerated angles. Disappointingly, the cloud is absent and so the whole thing looks less stormy. A single bolt does not a storm make. Probably the most contentious change is the removal of Storm Man’s left hand, and boy, does it make a difference. Without it, Storm Man looks unstable – you could interpret it as Storm Man sinking, or swimming against a current, or trying to get up off the floor by using the bolt as a crutch! A shrewd Redditor has even likened the pose to a controversial shoulder charge by the team’s star fullback Billy Slater during a 2018 preliminary final. The inclusion of the left hand would have provided Storm Man with additional balance to make him appear stronger. On to the type and it’s much less zany than before, but there are hints of customisation with notches in the “T” and “R” in “STORM” that echo the angular nature of the bolt. The treatment of “MELBOURNE” is still an issue though. Its placement leaves a void to its left that isn’t properly occupied by Storm Man. And why does it need to be so diminutive? Shouldn’t a team be prouder to proclaim its home town? It could easily be at least three letters (of “STORM”) wide and still be the secondary focus. Overall, this is a fine update for the Melbourne Storm. The refined Storm Man and type better reflect the professional level that the team plays at, and the stripped-down graphics will certainly reproduce better in small sizes and on merchandise. The trade-off is that the logo loses a lot of what made it fun, and I’d be interested to see how fans react to this less visually impressive design. My guess? They won’t be electrified.